I’m happy to report that, apparently, underneath it all, I am even keeled and warm hearted. Indeed, I have evidence that my actions can be more guided by caring than by the need to fight. I can state all this today, on a grey late winter Saturday afternoon, because one week ago my husband’s actions had me at a crossroads. Down one road lay a fight. Down the other was compassion. I am quite sure that in years past, I would have been very pissed, and would have initiated some kind of marital battle. Instead, I’d say I chose compassion — but the truth is, compassion chose me. I wanted to feel angry, I felt I should be angry — but it just wasn’t there. My brain has changed. All of which tells me that you, too, are “underneath it all” those same good qualities, because I believe my brain changed due to a regular meditation practice. Nothing remarkable, and nothing you can’t also do. In fact, I couldn’t wait to share my discovery with all my meditation classes last week, to let my students know that my personal experience proved to me the truth of research around the benefits of meditation. Not that I doubted Harvard, Yale, and the University of Wisconsin … Still, it was quite exciting to say to my students, if I can do it — and I did — so can you. Before I describe what happened, I hasten to reassure you (especially any family members reading this!) that, to say that the headline of this blog is an exaggeration is itself a gross understatement. 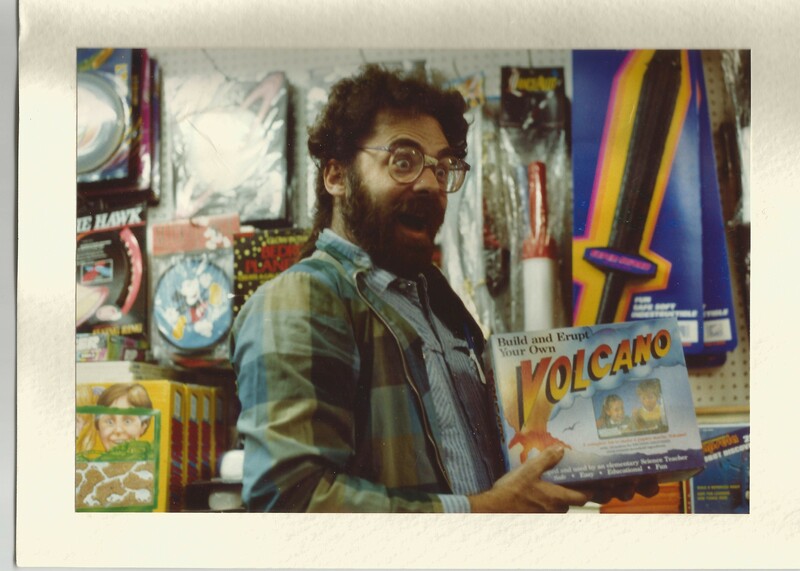 And that picture of him “going volcanic” is really … ummm … quite a few decades old. I’m just having a little fun here. The incident itself was only fun for one of us, and that one was not me. The timing of this year’s event was unfortunate for two reasons. First, Saturday was the night we turned the clocks back, thereby automatically losing an hour of sleep. Second, I was scheduled to deliver a sermon on happiness at my Unitarian Church of Montpelier the next morning — a very big event for me. This was also a semi-big event for Bob, because he and the rest of the Montpelier Ukulele Players were an important part of the service. They were on tap for the prelude (“When You’re Smiling”), special music (“What a Wonderful World”), and postlude (“Happy Trails”). In other words, Bob and I could both use a good night’s sleep. So, in the days leading up to the Scotch Slop, I repeatedly asked Bob, “please don’t get drunk.” Not that Bob is any way a drunkard, but I really really didn’t want him to be hungover on this particular Sunday morning. His reply to me was, “I usually do pretty well.” Which seemed fair. He hasn’t come home stinking drunk before. Before last Saturday, that is. That night, I went to bed early and slept for a few hours before waking up and realizing Bob wasn’t home yet. Not a good sign. My fears about a) how drunk he might be and b) how safe he might be (he was walking home, and it was seriously cold and the roads — covered in sludge which had melted during the day but frozen again after dark — were slick and difficult for even a sober person to navigate) quickly had me wide awake. Fortunately, it wasn’t long before he walked in the door. I asked, “How drunk are you?” He responded, loopily and happily, “Preeeettttty drunk! It was so happy! So many nice people!” Then he fell asleep, loudly. Stinking of Scotch. I did not fall back asleep, not for hours. I left the bedroom and tried the sofa. After a bit, I left the sofa in favor of the guest room. No luck there, either. As you can imagine, this did not make me happy. Yet, that’s when the magic happened. Or at least, appreciation of the magic that has already happened in my brain. As I lay there, trying every meditation trick I could think of to get back to sleep, I was intensely aware that my time for sleep — before my big morning in the pulpit — was slipping away. I also realized, amazingly, that I was not pissed off. Instead, I felt compassion for Bob. Not compassion as in “suffering with” — he certainly wasn’t suffering — but more a sharing of joy that he had enjoyed a night of fun companionship with the men of our community. Maple Corner has a lot of good men, and I was glad for all of the Scotch Sloppers that night. They do their best to do the right thing — for the planet, for the community, for their families. If one night a year they gather and get drunk, fine. Totally fine. As for Bob specifically, he’s an introvert who didn’t really have friends of his own before we moved to Vermont. He certainly didn’t participate in the community (not that there was much of a community to be part of). I am proud of, and happy for, how he has grown here. He took his responsibility to attend the Scotch Slop seriously. It was really kinda cute. Also, he didn’t purposefully rob me of sleep. Though his choices that night had a negative impact on me, he is normally exceptionally helpful and supportive. So, it was one bad night. Big deal. This lack of anger — a clear contrast to how I would have reacted in the past — stands out for me as clear proof that meditation has changed my brain structure for the better. Meditation isn’t my only happiness practice. I have a daily routine, which includes watching (& singing and dancing to) inspirational videos; these two by Louis Armstrong and Bruce Springsteen are current favorites. I also have a daily anticipations journal, a reminder bracelet, a savoring alarm on my phone, and an evening gratitude journal — really, it’s a wonder I have time to do anything else in my life, what with all these sincere attempts to walk the happiness talk. Also, because I teach happiness skills, and coach, and write about it … well, the general topic and all that it entails (living a life of meaning and pleasure, being kind, all that good stuff) are never far from my thoughts, feelings, and actions. Presumably, all this has changed me. Sometimes I respond to life in ways that surprise me. Last week, for example, walking on a snowy trail through the woods that opened up onto a sunny, snow covered meadow, I found myself bursting into little ballerina twirls of happiness. Like a child, just breathing into spontaneous joy. But who can really tell cause and effect? Is one particularly fierce hurricane due to climate change? No one can say. Still, when there is a pattern of extreme and weird weather conditions (how much snow did Boston get this year?? ), then maybe something is really going on. Nonetheless, I specifically attribute my calm and compassionate thoughts and feelings in the sleepless hours of Saturday night to my meditation practice. In particular, I’ve been doing a lot of meditation which corresponds to the three different operating systems in our brains, as discussed by neuro psychologist Rick Hanson in a book I think everyone should read, Hardwiring for Happiness: The New Brain Science of Contentment, Calm, and Confidence. Hanson explains that the three major layers of the brain (brain stem, subcortex and cortex) correspond with three operating system that 1) avoid harm, 2) approach rewards, and 3) attach to others. These systems function to meet our basic needs of safety, satisfaction, and connection — or, writ large, as Hanson himself does in a guided meditation as part of his online Foundations of Well-Being course, “peace, contentment, and love.” I have modified that somewhat to “peace, love, safety, and abundance” — four words that I breathe in and out on a nearly daily basis. My understanding, based on Hanson’s book and course, is that this meditation is like putting money in the bank for each system, thus allowing my brain to respond to a perceived “crisis” in a calm and compassionate manner, rather than flare up in an intense reactive mode. I have to say, I am convinced. The next morning, by the way, Bob was not hungover and both the ukulele players and the sermon itself went smoothly and were well received. Thus has my sleepless night turned into a gift, a learning tool I can share with others. I am actually grateful to Bob for the learning opportunity he provided me. I am also grateful the Scotch Slop only happens once a year! Madeleine warming up to a non-mercenary Santa in a museum, not a shopping mall. The concept behind Barbara Frederickson’s and Marcial Losada’s “Positivity Ratio” is common sense: to be a happier person, you can both increase the number of positive experiences in your life and decrease your exposure to negative situations. At a certain point — the exact ratio is a matter still under scientific scrutiny — the positive to negative ratio is high enough to allow for flourishing, thriving, living our best possible lives. Avoiding the negative could mean limiting your exposure to sensational news coverage, cutting back the time you spend in toxic relationships, or, in my case, staying away from shopping malls. Shopping malls give me the heebie-jeebies. Long ago, I used to enjoy malls, but now my little Vermont heart finds them emotionally and aesthetically displeasing. Worse — much, much worse — malls are ever-grinding gears in the capitalist growth economy.which is destroying our planet one shiny trinket at a time. For me, they are the very antithesis of both personal and systemic well being. Further, judging by my recent experience, malls are just not very happy places. So why was I in a mall on, of all days, the Friday before Christmas? Well, as the late great positive psychology pioneer Chris Peterson put it, “Happiness is not a spectator sport.” This wisdom applies to many aspects of life, not the least of which is nurturing relationships and taking care of loved ones. There are some things we just have to do. On this particular day, my daughter Jennifer, her two-year-old daughter Madeleine, and I had spent three long days driving to be with the whole family for two weeks of togetherness (at the beach, I won’t lie to you!). We were going to spend the night with a friend of Jennifer’s, but we had arrived several hours early. It was too rainy and chilly to play outside. Not only that, but Jennifer’s phone was dying. She is a hard-working single mom — redundant, I know, but she’s a tenure track college professor with a crazy number of demands on her time. She needs a working phone, for both professional and parental reasons. But Jennifer’s semester had been far too busy to carve out time to go to the phone store. This day, we were near a mall, with extra time, a phone kiosk, and a toddler that needed to get out of her car seat and run around. Plus, many modern malls have indoor playgrounds which Madeleine loves. Not only that, Madeleine needed a snack. So when Jennifer suggested we go to the mall to take care of all these needs, it struck me as more important to be a loving, supportive mother and grandmother than to either whine or pontificate about how much I hate malls. Happiness is not synonymous with narcissism. Into the mall we went. Immediately, we were walking through row upon row of women’s clothes, and I wanted it all. Oh, yes, I am as susceptible as the next person to the powerful forces of alluring displays and marketing magnetism — maybe even more so, since I am so rarely exposed to this stuff. I’m like an easy drunk. And I do not like this in myself. At. All. Right away, I was unhappy with my own shortcomings and with the whole damn money hungry mall machine but I kept quiet and kept going. Jennifer headed for the phone kiosk, leaving me determined to savor Madeleine’s enjoyment and try to block out the overwhelming stimuli all around — smells, sounds, sights — all designed to get me (& everyone else) to spend money now. The playground was in the midst of it all, but contained within by plastic walls @ three feet high, with a thick cushion floor and several modest climbing pieces for little kids to enjoy. In fact, a sign explicitly stated that the playground was only for children shorter than the sign — in other words, the pre-school set. Yet, the small play area was filled with much older and taller children who were playing fast and hard, quite oblivious to the vulnerable young ones trying to play on the same equipment. Madeleine is a tough and brave two year old. She also loves to climb. I tried to let her do her thing, and not be an over-protective grandmother, as the hyped-up big kids dashed madly about, ready to run over any toddler in their way, or knock a little one off the climbing structure. These kids were not being mean — they were just out of control, and in the wrong play area for their ages. Twice, I said to them, “watch out for the little kids!” Each time, there was a only slight pause before the mayhem resumed. Finally, Madeleine had enough and asked to leave. I was more than happy to go along with her choice. I can’t blame the kids. They were playing, and isn’t that what children are supposed to do? I just wondered, where are their parents? I looked, and looked — their parents were nowhere to be found. Madeleine was in that play area for at least a half hour, and the parents (or other responsible adults) never came by to make sure everything was fine (which it wasn’t). Over and over, I wondered, where are the parents??? Or even a mall employee? Very sad. What is wrong with our systems that children are left alone — in blatant disobedience to posted rules — for such a long period of time? Are unsupervised children deemed an acceptable price to pay for more money being spent? Next up was snack time. The playground was adjacent to the food court, but have any of you tried recently to find a healthy snack for a two year old at a mall food court??? Really, how much of this stuff is even really food? There were cookies, pretzels, candy, pizza, Chinese food, and burgers that I wouldn’t have minded putting in my own system but that I was not about to feed to Madeleine. Finally, I resorted to Starbucks, despite the fact that I am currently trying to boycott Starbucks (because, as a member of the Grocery Manufacturers Association, they have teamed up with Monsanto in a lawsuit against the state of Vermont because our representative democracy passed a law requiring GMO labeling of all food sold in our own state). Once again, taking care of my beloved grandchild triumphed over my political scruples. In Starbucks, I bought her a yogurt, granola, and strawberry parfait that seemed reasonably healthy. As we sat in the food court, Madeleine happily ate her parfait while I watched more unhappy, unsupervised children at the next table. There were three children, roughly six to 10 years old, apparently siblings, and they were not having a good time. The oldest and youngest (both boys) were fighting, and the oldest somehow made the youngest cry in pain. Later, the youngest got his revenge by using his feet to smash a package on the floor — a bag containing what appeared to be the oldest’s new pair of sunglasses. The middle child — a girl — sat impassively throughout. This went on for some time — half an hour maybe? I wanted to help somehow, but could not figure out what to do, other then tend to the little one in my care as we waited for her mother. Jennifer showed up, and then all three of us sat there for a while longer — and still the unhappy trio was alone at the table next to us. Again, where were their parents?? Whatever the answer — maybe they had to wait while mom or dad was working, not shopping — it was a sad situation. More mall fall-out? Or just the way it is these days? Either way, something is wrong here. Okay, I have nothing against Santa Claus. I like Christmas. I like this special family time, and exchanging small and thoughtful gifts — or, in our case, buying each other the experience of a vacation. I want this time of year to be magical for Madeleine (though not greed-inducing). But there was, in fact, a problem: visiting Santa, like everything else in a shopping mall, is just another opportunity to turn parents into consumers and cajole more money from them. Maybe my age is showing here, but as I recall, when my kids were little, the department store and mall Santa Claus’s were free. Sure, they were a way to lure parents into particular stores or malls, but the actual Santa experience did not directly involve commerce. Not anymore. Now, it is all about buying photos of your child on Santa’s lap. It is about commerce, not magic. Technically, visiting this Santa was free, but as we came to the front of the line — staffed by photographer/salespeople, not elves — we were asked whether we were just visiting Santa or were there to buy photos. When the answer was, “just visiting,” I got the distinct impression that we had just become second class citizens in Santa’s workshop. Madeleine was fine. She had a good time. She wouldn’t let Santa hold her on his lap, but she glowed all the same. 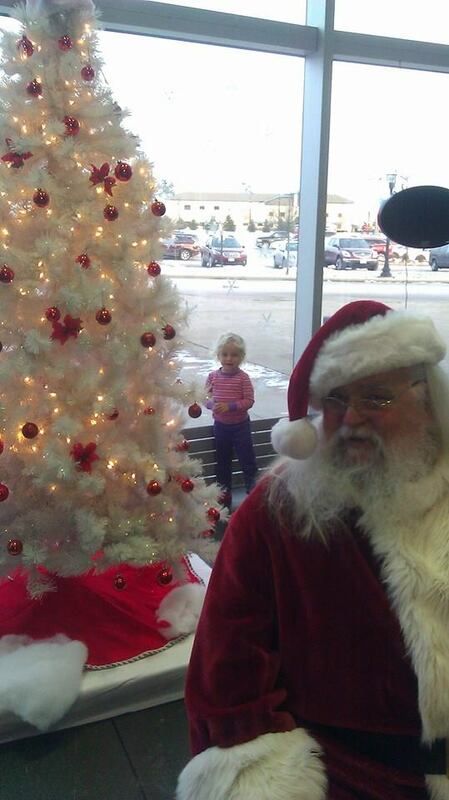 I was happy for her, but turning Santa into $anta cast a pall over the experience. Is nothing sacred? Yes, oh yes. I do hold life, community and nature as sacred. That is why I work for a gross national happiness paradigm and helping others grow their own personal happiness paradigms, governed by genuine well being, not internalized, insatiable, GDP-inspired desire. As for holding my obligation to future generations as sacred, that is part of the reason I pour so much effort into helping my daughter raise Madeleine, in addition to the fact that I’m flat out in love with her. Even in that mall, the love between us was sacred — as it was for many others in the mall, I am sure — but not much else was or is likely to be sacred in any shopping mall in the near future. Of course, there is much in life that is far more negative than shopping malls — but on both a personal and big picture level, it all adds up. Thus, for my positivity ratio and yours — and that of future generations — here’s to a happy new year far far away from shopping malls. Salud! 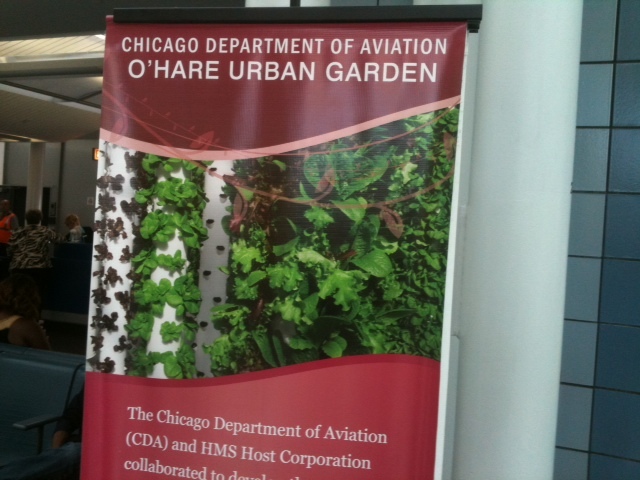 A hopeful sign of moving in the right direction: O’Hare airport’s vegetable garden! Last Saturday morning, I had an early flight to western North Carolina to celebrate a friend’s 70th birthday. I’ve been trying to say “yes” to life’s opportunities more often, so when the invitation came from my friend Lynn, I figured out a way to afford the airfare. I also love that part of North Carolina. These friends live about an hour east of Asheville, where the mountains are spectacular. Plus, I have another dear friend — a high school era BFF — an hour west of Asheville. This was a chance to spend time with her, too. It was all very last minute, but I said, “yes!” Yes, to a pleasant, meaningful, happy trip. Then in the car, I started complaining to my husband as he drove me to the airport. I said, I’d be much more excited if I was driving*, not flying — because, of course, everyone “knows” flying is just no fun anymore. It wasn’t major complaining, but I was definitely leaning into my brain’s negativity bias (which, by the way, your brain has, too!). That realization made me think about the power of intention, and attention. In any given moment, we choose (usually sub-consciously) what we pay attention to — and what we don’t pay attention to, don’t even see. It is simply impossible to pay attention to everything all the time. We can consciously choose to focus on the positive, or we can choose the negative. If you doubt the power of attention, try this quick video test. I’ve seen other versions, but I think this gets the message across. Yay for a 7:30 AM flight! Many flights leave Burlington at 6:00 AM. It is ever so much more civilized to leave the house at 5:30 AM than to leave at 4:00 AM. For some reason, I was totally prepared and ready to roll out of bed and into the car. Patting myself on the back! Bob offered to accompany me into the airport, not just drop me off outside. So sweet. So Bob. The check-in was totally smooth and pleasant. I didn’t even have to use one of those automatic machines which make me anxious. Instead, I got to deal with a pleasant and helpful human being. Yay for Skinny Pancake! It makes me happy to have this Vermont franchise, with its emphasis on local and organic products, in the airport gate area. Plus, I could buy bottled water from them in a resusable glass battle! Awesome. Pleasant interaction with a woman and her young adult son waiting to board. They were flying to Colorado for the start of his college career. Fun to wish them both well. Phew!! Especially pleased that this seatmate (a young man) seems to have a pleasant disposition. That is, he didn’t get upset when I spilled water all over him. Good thing it wasn’t coffee. Flying over my beloved Vermont and seeing some special spots from the air (like Shelburne Pond). Glad I chose only yogurt at the Skinny Pancake and not a muffin. I always seem to gain weight while traveling. At least I’m off to a good start. Happy also to fly over the Adirondacks, a magnificent wilderness area I can often see from the Vermont side of Lake Champlain. Though I would love to spend some time on the ground in the Adirondacks, we never do, because Vermont’s mountains constantly beckon. So it’s nice to get a good view of the Adirondacks this morning. It is a beautiful summer day. I was inspired to write! I so love it when I am visited by inspiration. An article in the in-flight magazine about Dutch aeronautical student Boyan Slat, who has developed a method of cleaning up the massive floating plastic garbage dump in the Pacific Ocean, fills me with hope. Traveling with a bathroom. Really, that’s soooo much better than mile after increasingly stressful mile in the car, wondering where I can possibly stop to use the restroom. Feeling like such a goofus on the plane — bumped my head, scrawled some ink on the back of the seat in front of me, and of course spilled water on my seatmate — but (and here’s the positive) — feeling so okay with this. Sometimes I get to be in a group where I am the wise one or sparkle in some other way. Sometimes, I’m the goofus. It is really okay. Plenty of peacefulness on the plane, making it easy to meditate. Appreciating the fact that meditation has become a joy and not a chore, and that I no longer worry about whether I’m doing it “right.” I know it’s right by how I feel, even squished into a tiny seat on a crowded plane. More signs of hope. They are everywhere, it seems. Solar panels, windmills, and, in Chicago’s O’Hare airport, of all places, a poster about the airport’s own vegetable garden. Awareness seems to be growing re sustainability changes we all need to make. I love Vermont but it is exceptionally homogenous. It is fun for me to see such a diverse population as the passengers in O’Hare. Talking with my granddaughter on the phone — really, talking with my daughter, because my granddaughter was too happy playing in the background for a phone call right now. I think that’s great. I’m happy she’s happy. Fun exchange with the flight attendant about the fact that non-dairy creamer is a poor substitute for half-n-half. I did NOT lose my laptop in the Charlotte airport! I put it down near the baggage claim area, to call my friend Lynn and let her know my status. After I grabbed my suitcase from the carousel and started walking away, I realized I no longer had my laptop with me! Mild panic set in, but I went back to where I made the phone call, and there was my laptop. So, so relieved. That would have put a real damper on this positivity list! Instead, it’s one of the highlights. Yay for “Eat More Kale” stickers! Montpelier artist Bo Muller-Moore hands out free, mildly subversive “Eat More Kale” stickers. I had stuck one on the plain black suitcase I borrowed from Bob, so this suitcase would stand out from all the others just like it on the baggage claim carousel. It worked! I spotted the bag right away. When Lynn picked me up, I really enjoyed looking at her simple but effective turquoise drop earrings and her matching turquoise blouse. Very pretty. With an hour drive to her house, Lynn and I had time to reconnect in the car after four years of not seeing each other. Then when we arrived at their house, I could reconnect with Mark, the birthday boy — once also known as my college adviser. Very special. Later, all three of us sat out on the deck drinking wine and eating crackers and cheese. Delightful. Lynn made a simple but scrumptious stir fry dinner, with chicken, bok choy, and rice. Perfect. The guest bed is super super comfortable!! With the windows wide open, I can hear the crickets chirping as I fall asleep. All in all, a good day made so much better by focusing on the positives — so much better, in fact, that I feel like my brain has been at least a little bit re-wired. I honestly look forward to my flight back home to see what joy it brings me. This was such an easy exercise. Let me know if you try it — I’d love to see your list! * Of course, driving would have been a terribly selfish choice, environmentally. I know some folks I know refuse to fly on environmental grounds, but nurturing relationships with lifelong friends seemed like a good enough reason to fly in this case. 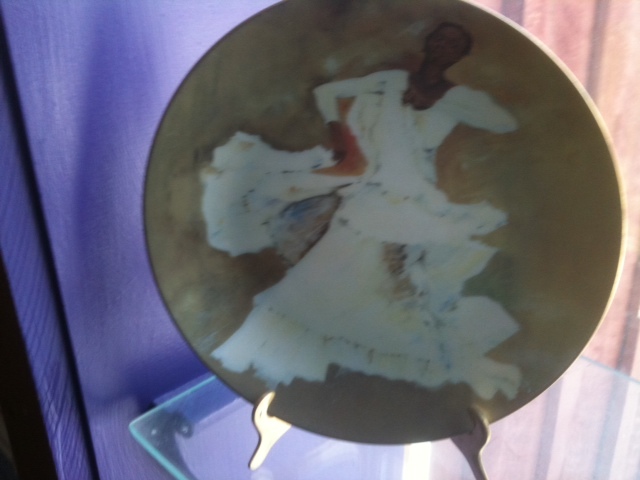 A piece of art in my house that is very worthy of savoring. If you’re like me, reading those words “quick and easy” probably awoke your skeptical self. Perhaps you’re thinking this sounds too good to be true — but in this case, it isn’t. I am utterly sincere. Savoring is quick, and easy, and can provide a valuable boost to anyone’s happiness levels. To be sure, many personal happiness strategies are challenging. Forgiving ourselves and others, for example, is emotionally daunting and time consuming, as well as ultimately quite rewarding. Another critically important happiness strategy is to quiet the nasty little voice of social comparison in our heads — especially in light of the environmental devastation wrought by consumerism and our sad efforts to keep up with our neighbors. Even though I believe passionately in the need to move to a gross national happiness paradigm, this one is still really tough for me. If I see someone in a colorful sundress or a shiny new Prius, I want, want, want! So I’m no believer in quick and easy happiness fixes overall. But, here’s a ritual I just started that is working so well I want to let you all in on the secret: everyday at noon, my phone is set to chime. That is my reminder to stop whatever I’m doing and simply savor. I’m only on day five of this new ritual, but each day has provided me with about five minutes of totally mundane magic. I’ll get back to those magical moments shortly, but first a little background. This new savoring routine is an outgrowth of a much, much more extensive happiness exploration I’m on — a 10-month Certificate in Positive Psychology program through Kripalu. The program includes a series of dynamic online lectures by Tal Ben Shahar. In one lecture, he presented the work of Barbara Frederickson and her Positivity Ratio; basically, when our personal happiness to negativity ratio pushes past 3:1, we are in the golden land of flourishing. To shift our individual positivity ratios, we can add more happiness experiences and moments, and, try to limit the negativity in our lives. Because it’s cumulative, every little bit helps. Solidifying new happiness habits and discarding negative ways that no longer serve us takes time and determination. In another of Tal’s lectures, he emphasized the difficulty inherent in making long-lasting change in our lives. He suggested we switch our mind-set away from “Self-discipline” and toward “Rituals.” Each of us was encouraged to choose or create very specific happiness rituals, set dates to begin each ritual, and just do it. Since I’ve loved savoring since I read Sonja Lyubomirsky’s “The How of Happiness” in early 2012, it made sense to build a savoring ritual into my life. My husband helped me set my phone alarm on Sunday March 31st, ready to start chiming every day at noon starting on Monday April 1st. Thank goodness for the assistance of modern technology! 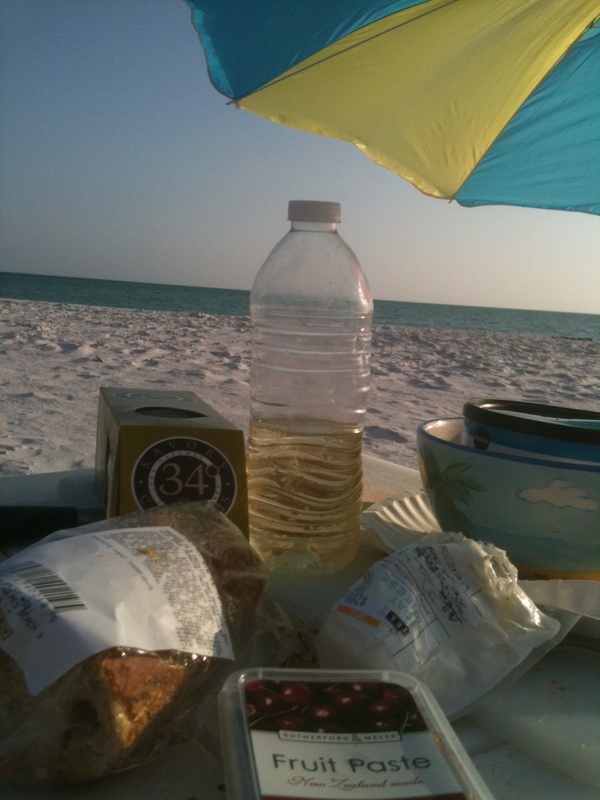 When the phone chimed on Monday, I had already forgotten my midday savoring plan! But when I heard the phone, I just stopped and looked around me to see what I could savor. It was amazing. Suddenly, with this very simple intention, I was seeing objects in my living room with fresh vision. Because I’m a painter, and spent many years on the art/craft show circuit, my living room is filled with wonderful pieces of art that I normally barely glance at. On Monday, in savoring mode, I was awed and overwhelmed by their beauty and flat-out wonderfulness. My happiness level soared. Magical. Tuesday, seemingly the first sunny day in months, the phone chime prompted me to dash out to my deck. I closed my eyes and basked in the warmth and glow of The Sun! Again, a magical happiness boost. Wednesday, I took time to savor my big country kitchen with its cozy woodstove, perfect for life in Vermont. Then I thought, oh yeah, I live in Vermont!! I looked out the window to savor the view and the very fact of living in this beloved state. You guessed it — more happiness magic. 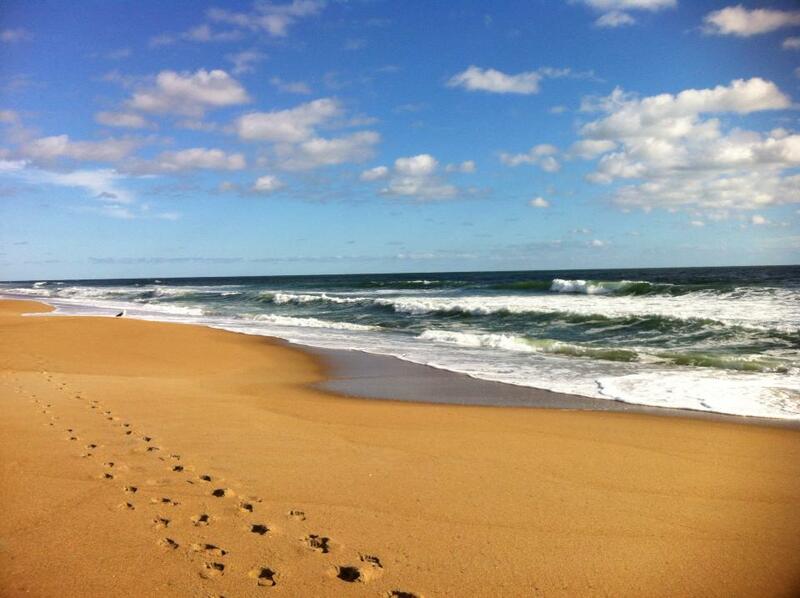 Soon I will be savoring the beach! Thursday was harder. I was in a parking lot when the phone alarm went off. I looked around me at the piles of melting dirty snow. Melting snow! In early April, that is well worth savoring, dirt or no. Ta-da, the happiness boost was there again. It just makes me grin that every single one of these moments was both magical and totally mundane. That’s why I love savoring — it is an option that is almost always available to us, and it works. Savoring works in part because it’s so interwoven with gratitude. Often, savoring is also about being mindful, being fully present — ie, taking the time to truly see and appreciate what is in front of us all the time. But, another beauty of savoring is that it can be focused on the past or the future as well. I just got back from a week visiting my granddaughter for her second birthday, and I am constantly savoring those early morning moments when she came walking quietly up to me in the dark and we hugged and kissed and began our day together. Savoring in the past tense is actually not always easy for me, because I can feel grief at what is gone. Yet I find that if I really focus on reliving the sensations I felt then, the past can once again bring me pleasure. As for the future, well, no problem there! Here again, modern technology is a reliable assistant. When I have trips planned, I love to visit the websites of places I am going to, and imagine the delights I’ll experience there. This future-savoring is in full swing for me right now, as I will soon be traveling to Kripalu for a week long immersion in the positive psychology program, followed by a week leading a Joyful Creativity Retreat on the beaches of North Carolina. There is an important caveat about anticipating and savoring the future. Once again, mindfulness is key. I know that I cannot hold too tightly to my idea of what will happen at Kripalu or in North Carolina. There is a delicate dance between anticipation and expectations. I am a big supporter of happy anticipation, as long as one is willing to experience what actually does unfold, whether or not events conform with expectations. So I’m excited about the upcoming trips, and, hoping I can just go with the flow. When I return, I will have plenty more to savor, in five minute chunks and in the big picture. Especially savor-worthy is the upcoming conference I am helping to plan, “Happiness and Wellbeing: Building a National Movement.” I invite you all to visit the conference website, and start savoring with me! I also invite you to set your smart phones or other alarms to a time of day when you could take five minutes to savor. If you adopt this ritual, please let me know how it works for you. I hope you also find these moments to be magically happy (but I won’t hold too tightly to any expectations!). I was briefly taken aback because I didn’t feel that happy. In truth, I was sad. Of course, cultivating happiness is not about dismissing or ignoring negative emotions. They are valuable contributors to the palette of life. So I quickly recovered my equilibrium enough to smile back and say, sure, yeah, I guess I am the happiness lady. My sadness is still with me today, and I’m okay with that. 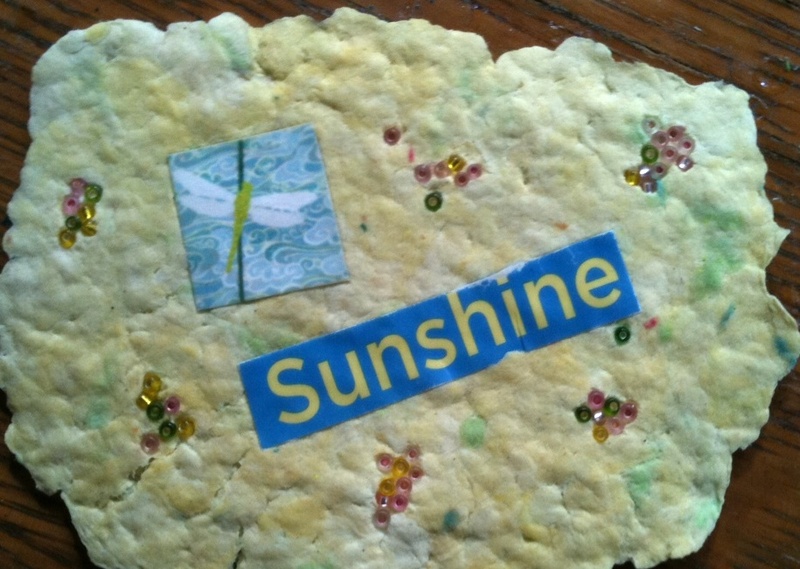 I just had two major losses in my life: 1) I closed my Happiness Paradigm store and 2) my baby granddaughter, who had lived with us for almost all her first 17 months of life, moved with her mother to a distant state. My granddaughter “helping” me with my suitcase as I prepare to leave her new home. Though both events are positive developments, there is nonetheless grief. My daughter landed an excellent job, which is critical to the long term well being of her and her daughter. Still, I deeply miss having a beloved baby under my roof. How could I not? As for the store … one reason I closed it was to open a new space in a more populated area where I can do workshops, mediations, coaching, and writing. But my new office is still being built from two old closets and isn’t ready yet. I’m feeling un-moored. Plus, it’s fall and the darkness is closing in. So, what is a sad “happiness lady” to do? Or you, for that matter? It’s a fundamentally important question, not only for my current minor distress but also for the much more daunting pain and struggles we will all be forced to grapple with sometime (s). Indeed, small challenges are also opportunities for us to practice the coping skills that we will need to endure the really tough suffering. What might those skills look like? For starters, they might look like the previous paragraph: shifting one’s perspective to find the positive aspects in a negative situation (ie, challenges are also opportunities). In my mediation training, we called this “reframing;” you could just say it’s looking for the cloud’s silver lining. Being aware of, and present to, our sadness is vital — as is humor. Comedian Louis C.K. combines both in this timely video my daughter alerted me to (a video that will be especially entertaining to Bruce Springsteen fans). Louis C.K. also highlights ways not to deal with sadness — another valuable lesson. I’ve cried on and off these past few weeks, and that’s good, too. In another timely internet offering, neuroscientist Mark Brady’s new blog on “Crying In Restaurants” observes that “tears of grief are filled with neuro-toxins and crying is one way the body is built to move them out of our system.” Tears are a great gift — if we give ourselves the time and space to cry them. I’ve found the time to do that, choosing to stay home alone or with my husband and just be with the sadness. There are so many other ways to cope, and your choices will be different from mine. My coping strategies include singing in the church choir (which combines community, spirituality, service, learning, and the transformative power of music); hard work (a huge home improvement project, designed to simplify our lives and substantially curtail our personal contribution to climate change); service to others (through another church committee, “Lay Pastoral Care”); and exercise (yoga, bone builders, and kayaking). And then there are my two favorite happiness strategies: gratitude and savoring. It is, after all, autumn in Vermont. When Bob and I kayaked on one of our favorite local lakes, the sweetly named “Peacham Pond,” it was a brilliantly sunny, cool, and windy Saturday. Perhaps because the water was choppy, we had the lake to ourselves — except for a half dozen loons. I was in love that day with Vermont, with Peacham Pond, with the tantalizing beauty of the foliage just starting to change, with my husband, with life. So much to be grateful for, so much to savor. My current bout of sadness isn’t through with me yet, but it sure did leave me alone for that glorious afternoon.